When it comes to slicing raw fish for sushi or sashimi, not just any knife will do! Sushi knives must be long, thin, and very sharp with just one cutting edge. Their shape and sharpness allow the user to create perfect sushi and sashimi by using long, single-direction cutting motions. The best sushi knife is one which ensures that all slices have a smooth, glossy appearance. Also known as a sashimi hocho or sashimi knife, a sushi knife is designed to prevent any sawing motions, which cause uneven or ragged cuts. Instead, sushi knives are meant to be used with a single cut and pull motion. Because most sushi knives are sharpened only on one edge, it is vital that you choose the one designed to fit your dominant hand. If you are left-handed, you’ll need a double-edged or left-handed sushi knife to achieve perfect cuts every time. The best sushi knife is one that cuts not just through sashimi, but that also slices through prepared rolls with precision and ease. 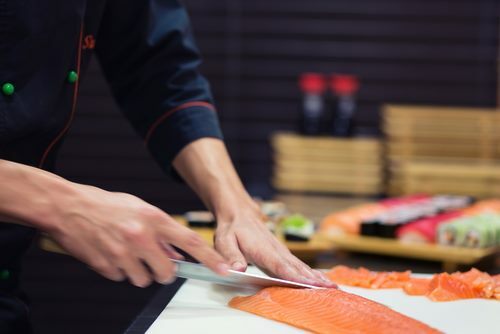 Note that specialized knives such as fish fillet knives can aid in the overall preparation process, depending on which ingredients are going into your rolls. The more advanced your sushi-making skills, the more tools you’ll enjoy using as you create attractive, enticing sushi. Whatever your skill level though, you’ll want at least one good sushi knife, along with the appropriate knife sharpening stone to maintain it. How to choose the best sushi knife? Sushi and sashimi knives are specialty tools, and it is important to take great care when making your selection. Origin – Not surprisingly, some of the best sushi knives are made in Japan. Consider the source when making your choice, but keep other factors such as price in mind, too. Material – While some sushi knives are made with stainless steel, a traditional Japanese sushi knife may not be stainless. Careful maintenance is required to prevent rusting. Dominant Hand – Very few sushi knives are designed for use with either hand. Look for one that is designed for your dominant hand, i.e. a right-handed or left-handed sushi knife. Handle – When choosing a sushi or sashimi knife, consider the handle. Not only do you want one that is very comfortable to hold while offering a secure, slip-resistant grip, you also want one that is well-finished, preventing the juice from fish and other seafood from penetrating and causing unpleasant odors. The knife’s handle should be easy to keep clean. Flexibility – A thin, flexible blade is desirable, but beginners may find it easier to learn with a slightly stiffer blade. Stronger blades stand up to heavier use too, so it is important to find a balance between strength and flexibility. Professional sushi chefs usually have a few favorite knives which they use for different purposes, and over time, you may wish to build a similar collection. Finish – Because raw fish has a tendency to stick, it’s important to look for a sushi knife with a finish that releases the fish rather than allowing it to stick. Weight – Most sushi knives are lightweight, making for thin, precise cuts. Watch out for those that are heavier than others; they might be able to create even cuts, but slices may be thicker and less appealing. Price – Entry-level sushi knives are available at a cost of around $20 or less; the best sushi knives come at far higher prices, with many at a cost of well over $200, and some at well over $1,000. How often will you be using your knife, and under what circumstances? If you plan to use it only occasionally at home, then a less expensive model might be the best sushi knife for you. We have taken these and other factors into consideration while testing knives and reading thousands of sushi knife reviews from experts and beginners alike. After carefully analyzing a wide range of sushi and sashimi knives, we’ve come up with ten of the best. While a few were chosen with budget in mind, it’s worth noting that the likelihood of manufacturing defects is higher in lower-priced models. Get the best sushi knife you can, care for it appropriately, and you’ll find it a pleasure to use. The Dalstrong Phantom Series sushi knife features a traditional blade with a long, narrow shape and a single-bevel edge for minimal drag and swift, agile cutting. The full-tang blade has been precision-forged from a single piece of Japanese high-carbon AUS-8 steel, and is ice-tempered for strength. An engraved design gives the blade an attractive appearance. The handle, which is crafted of black Spanish pakkawood, has been polished and laminated, and offers a traditional “D” shape for a comfortable feel in hand. 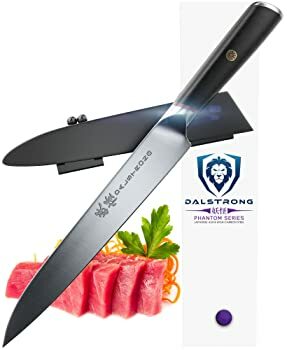 The Dalstrong sushi knife includes a protective velvet-lined cover, and comes with a 100 percent satisfaction or money back guarantee, along with a lifetime warranty. Great sharpness out of the box, gets even better with sharpening. This is by far my favorite! As a chef, a sharp knife is the most important tool for success. This one is sleek and moves effortlessly through boneless meats as well as fish. The Dalstrong Yanagiba feels heavy and thick in my hand, and the design is a little different than a regular yanagiba, making the body look a little fat. Overall, it feels very nice with a decent price. Cuts are smooth and easy, with very little friction. While professional sushi chefs may find the Dalstrong Yanagiba a bit heavier and more rigid than they’d prefer, it is perhaps the best sushi knife for someone who is honing his or her sushi-making skills and who wants a good-quality knife that will last for more than a few years. A bit more forgiving and less fragile than a thin, highly flexible sushi knife, it offers excellent sharpness and appealing results. 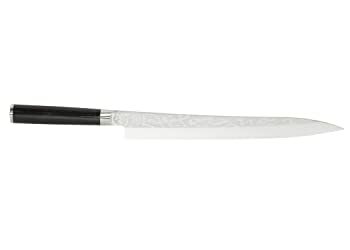 The addition of a velvet-lined sheath helps prevent accidental damage while adding to this sushi knife’s overall value. Designed with left-handed users in mind, this sushi and sashimi knife features a ten-inch long, razor-sharp blade of CROMOVA 18 stainless steel. Its edge is convex for quick release and reliable sharpness between honings, and is ice-hardened for dependable strength. A dimpled, sand-filled handle, seamlessly fabricated of the same stainless steel as the blade, gives the Global G-11L left handed sushi knife a look and feel of quality. This knife is sharp, modern, and well-balanced. 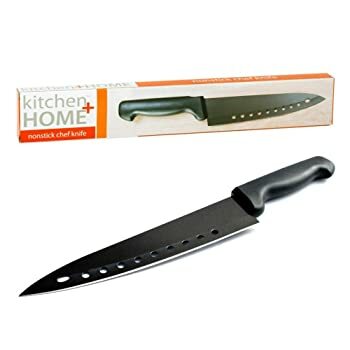 It is meant for professional kitchen use. As a sushi chef, it’s hard to find a quality yanagi, especially a stainless steel one that does not require frequent pampering. Essentially, this is a bare-bones knife that does its job well. At the $100 price range, you won’t find a better knife. Be sure to sharpen it correctly and maintain often with steel or ceramic knife sharpener. While most who use the Global G-11L sushi knife are left-handed professionals, this knife’s moderate price makes it a good choice for any left-handed person who wants to learn the fine art of making sushi. As it is one-sided, it is not suitable for right-handed users. If this knife appeals to you and you are right-handed, you will probably appreciate the right-handed Global G-11 Yanagi Sashimi and Sushi Knife, which offers identical features. The Kai Wasabi sushi knife is made in Japan, of Daido 1K6 high-carbon stainless steel, which has been bead-blasted for an appealing shine. Its single-sided blade features the Japanese character for ‘wasabi,’ imparting a unique, attractive appearance. The handle is made of an easy-maintenance polypropylene blend, which has been impregnated with an antibacterial agent for added cleanliness. For the cost, this is a great sashimi/sushi knife for the occasional homemade sushi dinner. It cuts easily through different fish and shellfish, and it cuts through rolls well, even without frequent rinsing. Handle with care! This knife is sharp. While making julienne cucumber for sushi rolls, I barely applied pressure and cut myself badly. It’s as good as an entry level shun knife! Thanks to its sharp edge, reliable performance, and low price, the Kai Wasabi yanagiba sushi knife is likely to please most home chefs. Demanding experts tend to find the plastic handle unimpressive, although they are generally pleased with the blade. If you are looking for a sharp yet inexpensive yanagiba, you may find that this is the best sushi knife for your needs. With an 8-inch non-stick, aerated blade made with stainless steel, the Kitchen + Home sushi knife is lightweight and easy to control. Its simple handle of black plastic contributes to its utilitarian appearance and its inexpensive price tag. This is a decent knife, a bit on the light side so it feels tinny in your hand. Very sharp out of the box though, and works well enough. The holes make it stick less, so it works excellently for its intended purpose, sushi. This is a good knife if you take care of it. It is very inexpensive, made with cheap steel, but takes to sharpening well. If you stick with cutting softer items, cleaning the blade after use, and occasionally sharpening, it will last a good long while. I use this solely to slice sushi rolls and softer vegetables. The Kitchen + Home non-stick sushi knife isn’t designed to stand up to the rigors of commercial use, and demanding home chefs may find it lacking. 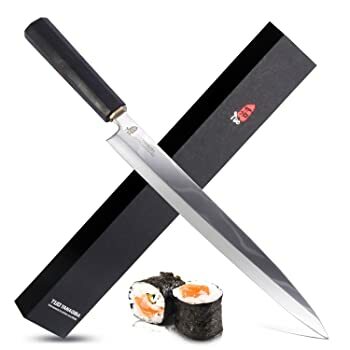 For those who want to experiment with sushi-making, but who do not want to make much of an investment, this knife is likely to be satisfactory. The Mac Japanese Series nonstick sushi and sashimi knife is made in Japan. It features an 8-1/2 inch blade of high-carbon molybdenum steel, along with an attractive handle of black pakkawood. A non-stick coating helps this sushi knife ease its way through all the ingredients inside your rolls, assuring clean, attractive edges. With double edges, it is suitable for use as a right or left-handed sushi knife. I have been using this knife every day in a professional setting and overall it is pretty good. It’s razor sharp; by far the sharpest knife I’ve ever bought. The tip is fragile however; a slightly forceful knock on the cutting board resulted in a small chip, which was resolved at the first sharpening. I’m using this knife daily for making sushi professionally and I couldn’t be happier. Like many high-quality sushi and sashimi knives, this one is both sharp and flexible. It is thinner and more lightweight than some of the lower-end sushi knives reviewed here, helping to prevent fatigue while creating thin, visually appealing slices of sashimi. At the same time, it’s nonstick surface helps prevent rice and other ingredients from sticking when slicing through completed sushi rolls. Thanks to its moderate pricing, this sushi knife is a good choice for home use as well as in professional settings. With your choice of a traditional wooden handle or a bacteria-resistant NSF handle, the Mercer sushi knife features a blade of high-carbon Berman steel for good resistance to rust, discoloration, and corrosion. Its single edge has been taper-ground and given a fine stone finish for razor sharpness and effortless, nearly friction-free cutting. A lifetime limited warranty is included. Like other Mercer knives, this one meets NSF’s standards for safety, quality, and performance. This is a nice knife for the money. The blade has a decent edge right out of the packaging, and the handle has a decent fit and finish. 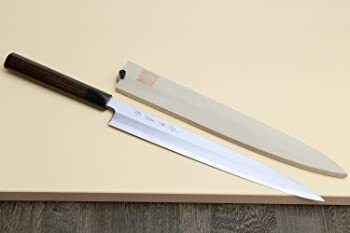 I wanted a decent but cheap yanagiba to become familiar with its use and sharpening. I am thrilled with the knife for this purpose. Most users are quite happy with the Mercer Culinary Asian Collection Yanagi Sashimi knife, mentioning that they use it for a variety of fish, meat, and vegetables commonly enjoyed in sushi rolls. While it is not likely to satisfy a professional, it is a good choice for the average home cook, and it is shaped and sized properly for learning sushi techniques. If you’re left-handed, you may want to check out Mercer’s left-handed Yanagi sashimi knife, which offers identical features. The Shun Pro 10-1/2 inch yanagiba sushi knife features a single bevel blade of VG-10 super steel for an edge that is easy to sharpen, and that retains sharpness between honings. The blade boasts a hollow-ground back for precise cutting and easy release, and has been graffiti-etched for an attractive appearance. The handle is of premium pakkawood, and features a traditional “D” shape for a comfortable, secure grip. The Shun Pro sushi knife is made in Japan, and is NSF certified for use in commercial kitchens. A limited lifetime warranty is included. This knife not only cuts through fish and maki rolls in one slice as advertised, it is also beautifull crafted. My only regret is that it doesn’t come with an edge guard. It is as good as it looks! The knife is extremely sharp and is perfect for sashimi and sushi workers. Being a professional chef, I recommend it to everyone. The Shun Pro sushi knife is designed with professional chefs in mind, and it delivers a satisfactory experience to most who use it, with many mentioning that it’s among their favorite knives. Its price is not prohibitive though; for this reason, it is also recommended to serious hobbyists who enjoy making sushi at home. With a razor-sharp blade of Japanese surgical-grade stainless steel, the Soufull sushi knife also offers an attractive appearance via a gray leather wood handle with double rivets. Its 2/3 tang design makes for a light weight in the hand, while double rivets provide a secure feel. Designed for sashimi, sushi, and rice rolls, it features a single edge and comes with a gift box. This is an amazing sushi/sashimi knife, especially for its price. We used it to cut Hamachi, tuna, and salmon and it performed very well. Highly recommend! This knife arrived sharp as a razor blade and holds its edge very well. 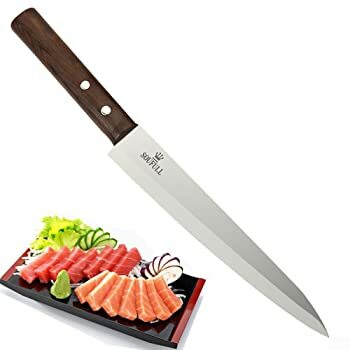 Great for slicing any kind of meat or sushi; very satisfied with the quality at this price point. One of the best sushi knives for home chefs on a budget, this model from Soufull features a basic, utilitarian design that also manages to deliver an attractive appearance. While it might not be ideal for use in a commercial setting, or satisfy someone who is accustomed to high-quality brands such as Shun, this sushi knife gets overwhelmingly positive reviews from users who were in search of a cheap sashimi / sushi knife. The Tuo Yanagiba sashimi and sushi knife features a single-bevel blade with forged construction consisting of 34 layers of Damascus steel for outstanding strength and a traditional, attractive appearance. Its ebony handle features an octagonal shape for a good grip and excellent control. A lifetime guarantee assures quality craftsmanship and serviceable use. A few reports of poor quality control; knives arrived unsharpened. Most were satisfied with replacements. This knife is extremely sharp, with the edge on one side only. Be sure you don’t sharpen the flat side! It’s my go-to knife for cutting my sushi rolls. For the price this knife is simply superb. I would do what others have recommended and coat the handle as it is porous wood. Right out of the box I was able to slice pretty much anything. The Tuo Japanese sashimi and sushi knife is a good choice for home cooks with moderate budgets. It performs well and offers a very attractive appearance, however reports of manufacturing flaws are likely to cause professionals to steer clear and opt for more expensive, top-rated sushi knives. Made in Japan using traditional materials and a traditional design, the Yoshihiro Shiroko sushi knife features a 10.5-inch single-edge white steel blade with a flat grind on the front and a concave grind on the back. A handcrafted Japanese-style D handle of Rosewood imparts a lovely appearance and a balanced feel. This knife comes complete with a magnolia wood sheath a rust eraser, and knife oil. It must be hand-washed and dried, and requires sharpening on quality whetstones. 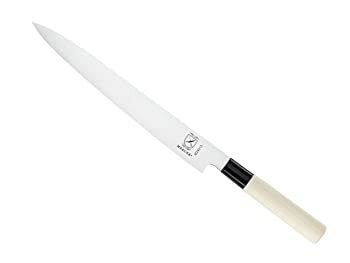 The knifemaker notes that this is the best sushi knife for boneless fish only, and is not for use on hard objects or low-quality cutting boards. I work in a sushi restaurant and asked for recommendations from other chefs. I wasn’t willing to pay for the $300-900 knives they recommended, so I found this one. Everyone is impressed with the quality, and the extras as well as the care instructions. The knife is beautiful! Well-executed classic Japanese shaping, grinding, and polishing. Out of the box, the lade is sharp and has performed well in some basic slicing. Amazing for the price point. Because it requires special care, the Yoshihiro Shiroko sushi knife is recommended for professionals and serious hobbyists. Its price point makes it one of the best sushi knives for newer chefs who are not yet ready to invest in a high-end sashimi knife, as well as an affordable option for anyone who wants an authentic Japanese sushi knife. You’ve probably made quite an effort in choosing the best sushi knife for your unique purposes. Be sure that you take great care of it: When you do, you’ll be rewarded with years – maybe even an entire lifetime – of use. Wash and Dry Carefully – Be sure to hand-wash your sushi knife, even if the manufacturer says that it’s OK to put it in the dishwasher. Use hot, soapy water, but avoid bleach, which can cause pitting. Once you’re finished with the washing process, take care to dry your knife completely before putting it away. Oiling – Even if you have selected a stainless steel sushi knife, you may want to protect it with food-grade mineral oil between uses. This will prevent damage and discoloration, which can happen when a knife is exposed to humidity and other environmental conditions during storage. Storage – Because contact with other objects (particularly those made of metal) can cause damage to your knife’s sharp blade, you’ll want to protect it with a sheath or keep it in a specially designed stand. If you opt to store your sushi knife on a magnetic knife bar, be very careful when placing it on the bar and removing it. You’ll want to avoid dragging the blade’s sharpened edge across the knife bar, as this can cause dullness and damage. Sharpening – Be absolutely certain that you sharpen your sushi knife correctly. If you do not know how to do this, you’ll be glad to know that a professional knife sharpener can take care of the job for you. You can also find good tutorials on YouTube. Consider practicing on an unimportant knife until you’re confident that you can sharpen your sushi knife the right way! Proper Use – Don’t use your sushi knife for anything other than its intended purpose. Use it carefully, and only with a high-quality cutting board made of wood or plastic. You might be tempted to use your sushi knife on a metal or glass cutting board, but doing so is likely to cause premature dullness and/or chip the blade. With meticulous care, your sushi knife will bring great pleasure over the years, helping you to create amazing rolls for everyone to enjoy. We wish you the best in your culinary journey!